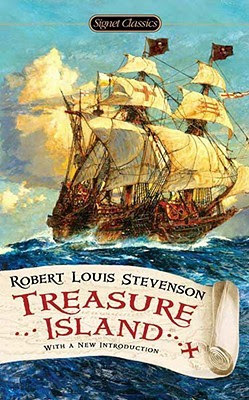 The most popular pirate story ever written in English, featuring one of literature’s most beloved “bad guys,” Treasure Island has been happily devoured by several generations of boys—and girls—and grownups. Its unforgettable characters include: young Jim Hawkins, who finds himself owner of a map to Treasure Island, where the fabled pirate booty is buried; honest Captain Smollett, heroic Dr. Livesey, and the good-hearted but obtuse Squire Trelawney, who help Jim on his quest for the treasure; the frightening Blind Pew, double-dealing Israel Hands, and seemingly mad Ben Gunn, buccaneers of varying shades of menace; and, of course, garrulous, affable, ambiguous Long John Silver, who is one moment a friendly, laughing, one-legged sea-cook . . .and the next a dangerous pirate leader! The unexpected and complex relationship that develops between Silver and Jim helps transform what seems at first to be a simple, rip-roaring adventure story into a deeply moving study of a boy’s growth into manhood, as he learns hard lessons about friendship, loyalty, courage and honor—and the uncertain meaning of good and evil. This book started many well-known sayings, nods and tributes towards pirates and the sea life - the love pirates have of rum, Long John Silver, treasure maps with the X marking the spot, the bird on the shoulder of the pirate, some of the songs...it all had to start somewhere, and apparently Treasure Island hit the spot. It's filled with well-rounded, enjoyable characters - Jim as the main, a mere child, was easy to enjoy as he led most of the story through his viewpoint. Long John Silver was twisted but fascinating and, having not read the story before, I was surprised with some of the faces he showed. Yes, I've been living under a rock in that regard. Stevenson is a good writer - his words make a smooth sailing experience, talented and pretty but keeping on point to hold up pacing. Despite perks, the story itself is only average to me since I wanted a full fledged adventure and felt more could have been included. Skeleton Island had a personality we didn't get to fully explore, and most of what happened was predictable with little surprise. Sure, I didn't see some of the small twists, but overall the surprises weren't strong. The book shines brightest at the beginning at the inn, but I thought it would keep going strong when they set sail. Instead sea travel is abbreviated and the rest of the book focuses mainly on the internal fighting of the men. While this was interesting, I'd like to see other things thrown in to shake things up. Keeping it a little basic makes it clear to me he was writing this more with young readers in mind. Overall it was a book that started much and deserves its place as a classic treasure. The writing is well done, the characters rich, although the story is a little bare bones.